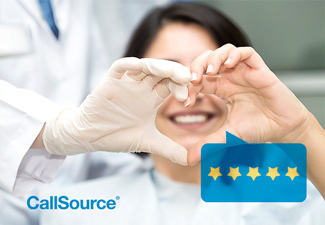 Online reviews are vital to your dental practice if you want to continuously increase a new patient-base continuously. A few years ago, I moved over 3,000 miles away – all the way across the country – from Connecticut to California. As you do when you move somewhere new, I needed to find lots of new providers. There were many that I had to look for. A new primary care physician. A new hairstylist (hey, my old one was hard to beat). Obviously, there were more things that I needed to find than listed above – but let’s focus on the one that matters to you. Are new patients finding your dental practice? Another question to pose: How do you think new patients search for and choose, a new dental provider? There are probably a few main ways. Who is listed on their insurance providers list. Of the above list, in this year of 2018, what do you think the first option most likely is for the majority of people nowadays? That’s right – with smartphones at our fingertips and computers in most of our homes, it is easy to search for anything that we need or want. Now how do you make sure that your practice shows up when someone is searching the web for a new dentist? Perhaps the title of this article gave it away. 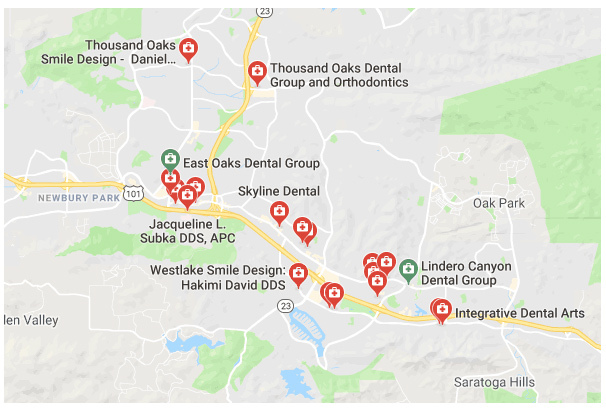 If you conduct a Google search for “dentists near me” as I did (shown above), after the PPC ads placed at the top, your very first search result will be from the Google Local Pack. By clicking to view the list that Google provides, you will be presented with a slew of results. Along with those results, you will see each practice’s online review star rating and how many reviews they have each received. And which do you think that consumers will pay more attention to? Those with higher reviews, of course. Look at all of these results that I received within a less than 10-mile radius here in Westlake Village, California. (And this is only page 1). The choice of who to pick isn’t obvious – it’s the online review presence and research on other patients’ happiness with service that will help me choose one. And this isn’t just an opinion – studies find that 74% of people trust local businesses more after reading positive online reviews. Open another tab in your browser and do the same search as I did above. Type in “dentist near me” or “dentist online reviews.” How many results did you receive? Do you see your practice as a top result? If so, great job! Keep that momentum up. If not, hopefully, it is a wake-up call that online reputation management needs to become a higher priority in your office. Sure, you can always spend more money on additional marketing tactics as well (which you should always use call tracking numbers for – see why call tracking is a must for your dental practice here! ), but a great online review presence also works as a free marketing tactic. Maybe you don’t have enough in your marketing budget at the moment to place online ads or send out direct mail – but you always can dedicate time to continuously earning online reviews to aid in your marketing and online presence. Sure, we are focusing here on how online reviews to aid in your new patient acquisition efforts, but that is not to say that they do not also help in current patient retention. If patients are willing to leave you a good review, that demonstrates that they are happy with the service they are receiving. But do not expect only to receive gleaming, out-of-this-world approval. With any negative or critical feedback, you can make an unhappy patient happy with the right response, and you can also address patient concerns within the office by making changes to internal procedures based on patient feedback. Convinced that online reviews are important for your business yet? No?! Go check out our online reviews infographic chock-full of jaw-dropping stats, or any of our many articles focused on the topic of your reputation management. Yes? Phew, thanks. You made me feel better about doing my job well. So now you know why online reviews are important for your dental practice – but how can you start earning more online reviews? We have you covered with some templates here! Curious to learn even more? Great! Contact a CallSource representative today and learn about our online review platform and how it can help your business and your online review management goals. I like how you explain how having a great online review presence can help dentists market their office towards new patients as well as you know how happy your current patients are and to find any concerns to change. When someone is looking for a new dental office to go to, such as if their old one is retiring or if they’ve moved, it would probably be a good idea to read reviews from a variety of sources that are reliable and to check out the professional’s website. Having a website would be a great way for dentists to quickly provide people with their qualifications and background information as well as their specializations and services so that people can figure out which one can best help with their situation. Most of the patients are looking for dental services on the internet and having a good online reputation and reviews converts those prospects into patients.